In the future, fruit growers and processors from Pčinja, Jablanica and Toplica Districts in South Serbia will be doing business and realising their interests together through the South Serbia Regional Fruit Cluster, established at the today's founding meeting in Leskovac. The aim of the Cluster, in addition to fruit production and processing, is to strengthen the capacities and improve competitiveness of this area. The establishment of the Cluster was financially supported by the European Union and Swiss Government through European Partnership with Municipalities Programme – EU PROGRES. The Constitutive Assembly of the Pešter Agro Cluster, composed of milk and dairy products manufacturers and processors form Novi Pazar, Sjenica i Tutin, was held today, and the main goal of this association is to develop the agriculture sector. Via joint approach of the manufacturers, this will soon facilitate the placement of milk, cheese and kajmak from the Pešter plateau at the local and foreign markets. The establishment of the cluster was financial supported by the European Union and the Government of Switzerland through the European Partnership with Municipalities Programme – EU PROGRES and the Czech Development Agency, while the Sandzak Economic Development Agency SEDA coordinates activities. Three destinations of European relevance – the neolith settlement Pločnik, Đavolja Varoš and Caričin Grad – will soon find themselves within the joint offer of the Mt. 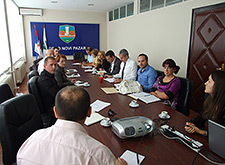 Radan Area Tourist Cluster, the constituent assembly of which was held in Prolom Banja today. 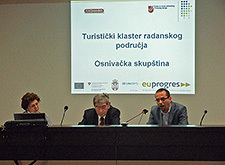 The cluster was set up to promote tourism in Kuršumlija, Prokuplje, Bojnik, Medveđa and Lebane and improve the capacities and competitiveness of this area. The establishment of the cluster was financially supported by the European Union and Government of Switzerland via the European Partnership with Municipalities Programme – EU PROGRES. 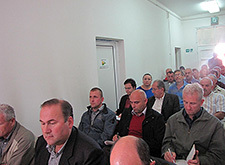 With support from the European Union and Swiss Government through European Partnership with Municipalities Programme – EU PROGRES, the municipalities of Prokuplje, Surdulica, Bujanovac, Novi Pazar and Ivanjica are introducing Quality Management System (QMS) and Environmental Management System (EMS). The project will be completed in February 2013 when these municipalities will be expected to be prepared to receive ISO 9001 and ISO 14001 certificates.